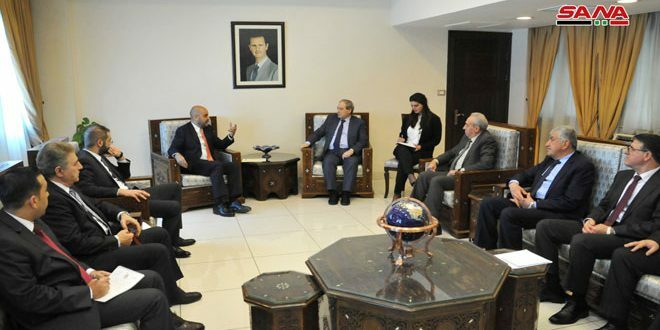 The delegation was headed by Tarek Khouri who discussed with Faisal Mikdad the relationship between Syria and Jordan reports SANA. On Sunday, Deputy Foreign and Expatriates Minister, Faisal Mikdad received a Jordanian parliamentary delegation headed by Tarek Khouri, head of the Syrian-Jordanian Friendship Committee. The delegation’s members stressed the importance of continuing relations between Syria and Jordan and fighting terrorism to ensure the security of the people of both countries. Mikdad, for his part, stressed the importance of parliamentary diplomacy, which should represent the citizens of Arab countries and their aspirations in relation to confronting terrorism and all other challenges facing Arab nations, especially with regards to achieving sustainable development and scientific advancement and confronting attacks.